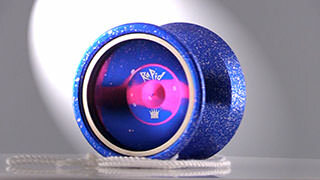 Review of the Replay Pro Yoyo by YoYoFactory. 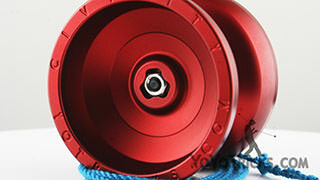 This yoyo is the Replay Pro and this yoyo has us really excited because we haven’t seen a yoyo at this price point, coming in at under 20 Dollars, that has this level of performance. 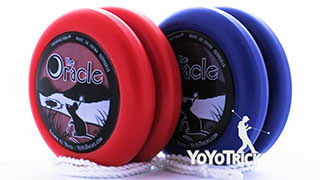 There’s a lot of qualities that this yoyo has that allow it to play that well so we will just get right to it. 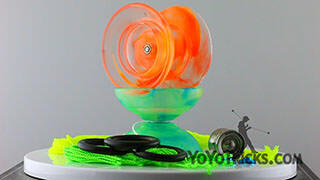 The first thing that you are going to notice about this yoyo is this plastic, it is a really durable polycarbonate and if you are familiar with the Flight yoyo. 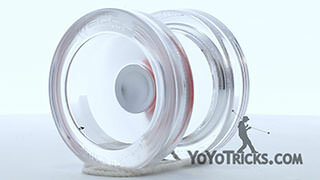 You will see that it is the same kind of plastic and what we have found with the Flight yoyo is even though it is an Offstring yoyo and even though you are hitting it on the ground and it is bouncing all over your house, it has held up extremely well. So we have high hopes that the Replay Pro is going to prove just as durable. 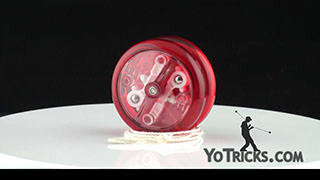 The other thing you are going to notice about the plastic is that this area right here right around the yoyo is extremely thick, so if you think of the overall weight of the yoyo, most of it is going to be centered right here, right around the edge. 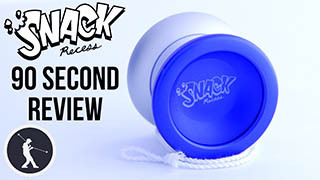 That is going to give it a lot of its distinctive play features, most notably is that it really doesn’t tilt all that much while you are performing advanced tricks and it is not going to turn a lot while you are doing your tricks as well. 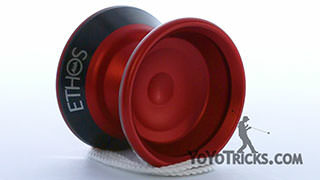 So there is other qualities about this yoyo that help that, and to see those we are going to open the yoyo up. Now when you first get your Replay Pro you may find it squeaking a little bit when you take it apart. The reason for that is just because the bearing is fitting really tightly onto the bearing seat. That is actually not a problem at all it is not going to affect play or even be a problem that it squeaks a little bit when you open it up. So you don’t need to worry about that. 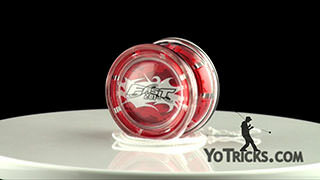 The bearing is actually one of the notable things about this yoyo. 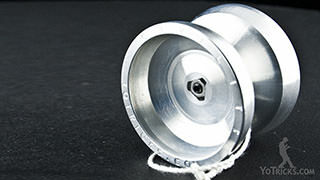 This is a CenterTrac Bearing, which is a 10 Dollar bearing which is pretty impressive considering this whole yoyo typically costs right around 16 Dollars. 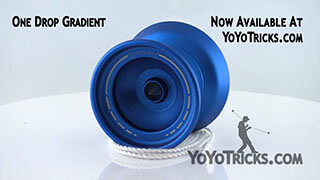 So in some sense you could say this was kind of an extravagance that was not really necessary but it shows YoYoFactory’s commitment to making this yoyo play as good as possible. 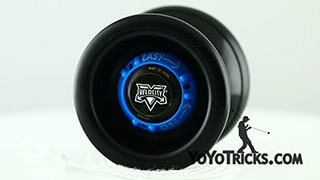 Because it has got a CenterTrac Bearing this also is part of what contributes to its ability to resist lean during difficult tricks. The other thing that helps a lot is you can see right off of the response pad, the wall kind of drops down, people have taken to calling that a zero wall right now and its the same type of thing. 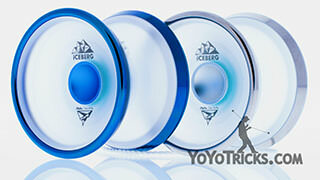 It helps it have extremely long spin times and also helps it resist those leaning tendencies that yoyo’s can have. So when you want to perform maintenance on this yoyo because the bearing is going to fit pretty tight on the bearing seat. 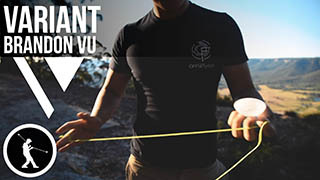 You are going to want to use a multi-tool, the nice thing is because of the plastic it actually comes off pretty easy even though it is pretty difficult to get it off with just your hands. Replacing it will be really easy as well. 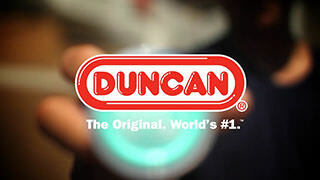 Of course just like any bearing you are going to want lube that bearing with thin yoyo lube. So if you end up getting the Replay Pro Players pack it is going to come with both of those items, the yoyo, the multi-tool and as well as the lube. 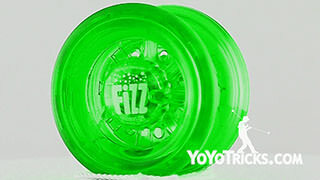 Assembly is pretty straight forward because there is no spacers or anything it just fits right on the plastic and then you can just put the yoyo right back together. You will also notice it has the standard slim 19mm pads, in this case it came with blue, which we are a really big fan of and it works really well with this particular model. So one of the more unusual design choices about the Replay are these caps on the inside. If you are anything like me you are going to be tempted right away to pop those caps out and see what is underneath and we highly recommend that you don’t do that. 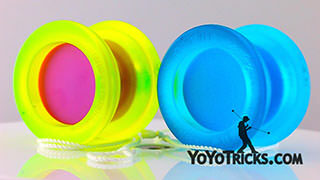 One of the reasons is if you were to pop the cap off you what you would find is that the plastic around the bolt underneath the cap is actually molded right around the top the bolt and so if you try to push this bolt through the yoyo it will actually crack the plastic and ultimately break the yoyo. 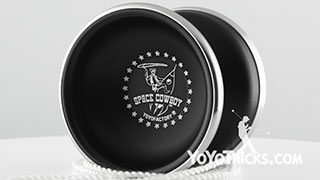 And YoYoFactory has commented to us specifically that the caps are not just a design choice but they actually help the yoyo perform as well as it does so just in general, removing the caps is best to be avoided. 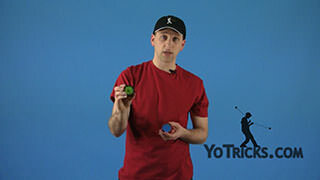 So the one thing that we really can’t communicate to you through a video is just how good this yoyo feels to hold it, and to throw it and to play with it but of course we can show you tricks. Lets get right to it. 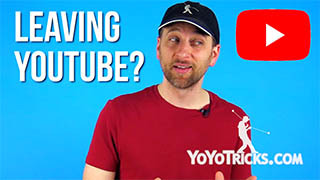 So one thing that we really like about the Replay Pro, is that really actually good for a wide variety of tricks and if you are style developing your own style that’s going to help you out quite a bit. Now one thing that you may not expect is that it is actually really good for regenerations and even though it is probably not designed for finger grinds it is actually not half bad at hitting those as well. 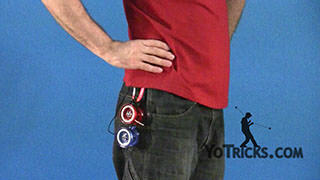 Now if you look at this area right here because it backs up into the yoyo a little bit, it is actually not half bad for your off axis finger spins. 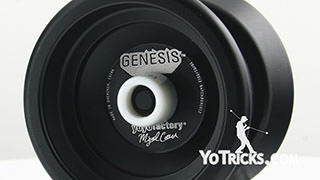 And speaking of off axis, because of its ability to resist tilt it is not a bad yoyo if you are starting to get into off axis to kind of get used to how those tricks work and even to learn your off axis fundamentals. 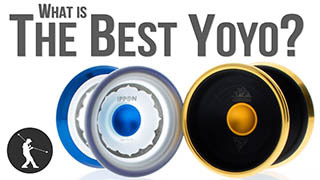 So if you are comparing this yoyo to metal yoyos that are twice the price, it is not going to quite compete on that level especially for yoyos that are designed for grinds and for really advanced play. 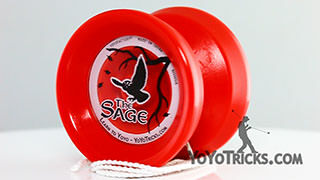 But for pretty much any yoyo that is under that 20 Dollar price point, including some of those metal yoyos that you can find on the market. 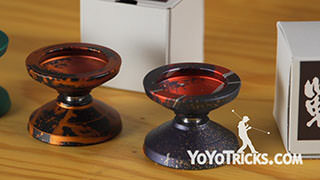 What we found is that other yoyos they just can not hold a candle to the Replay Pro. And so we are really excited to be able to make it available to you, definitely check out our pack, the Players Pack for the Replay Pro. 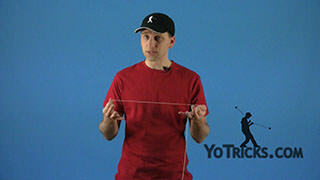 That has everything you need to get the most out of this yoyo and that is YoYoFactory Replay Pro.